BUILD YOUR BUSINESS HERE! 2.5 acre site (consisting of 3 parcels) in a great location with I-270 exposure of over 100,000 vehicles daily! Currently zoned M-2 manufacturing district of the City of Columbus. 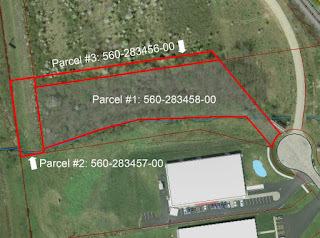 Conveniently located of off Scioto Darby Creek Rd - just south of Fishinger Blvd and north of Roberts Rd in NW Columbus. Wooded lot with creek. If properly zoned this lot/location will be perfect for a showroom, manufacturing, warehousing (logistics), storage/mini-storage or offices. The possibilities are endless! Hilliard schools. Only $159,900! Call DeLena today!